After having finished my first projects with an Arduino I started to look for ways, which would allow me to port my project to an Arduino-compatible minimum configuration board. Ideally, I wanted it to be much cheaper than a new Arduino board. 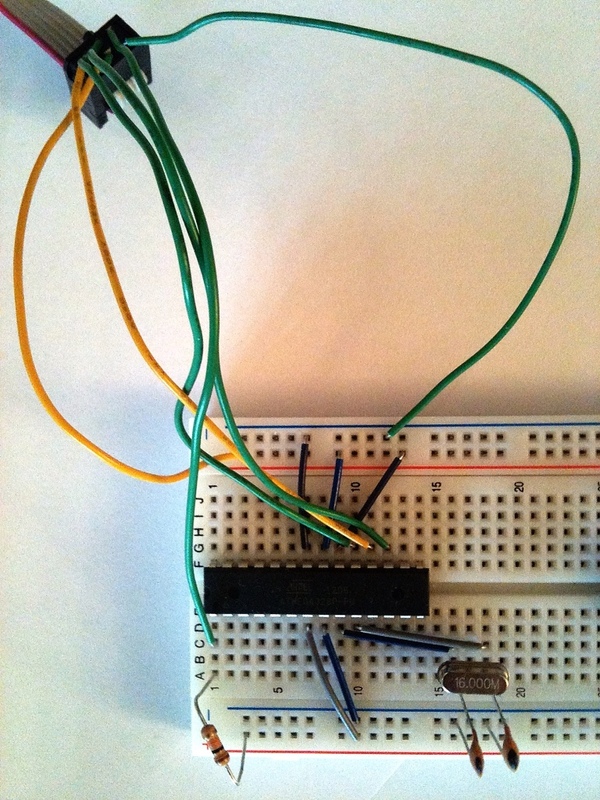 In this post, I describe how to put together a working protoype on a breadboard that can easily be programmed with the Arduino IDE afterwards. The Arduino Duemilanove, which I used for my projects, uses a through-hole ATMEGA328 microcontroller. The currently new Arduino Leonardo uses an enhanced SMD version of the microcontroller. Using SMD parts allows a very compact PCB design and the components are mostly cheaper than their through-hole alternatives. The caveats, however, are that SMD components are more difficult to solder and the equipment needed for soldering is more expensive. Thus, I decided to work with though-hole components only. In the following, I describe how to build a minimum configuration for using an ATMEGA168 or ATMEGA328 which can be programmed with the Arduino IDE. A major difference to an Arduino board is the lack of the USB socket for programming the microcontroller. In our case, we are using the in-system programming (ISP) capability of the ATMEGA and, thus, make use of a so-called programmer. This is a piece of hardware, which is available in many forms and from many different companies. 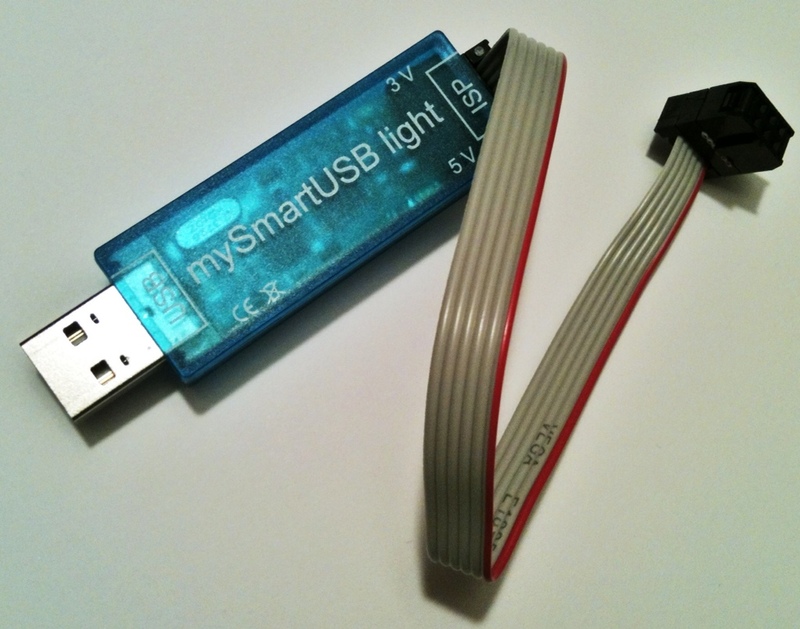 In simple words, it is that piece of hardware that lets you transfer your program onto the microcontroller. The question, which programmer I am using, is answered later in this article. Another help was a close look at the “Sippino“, which is a minimum-configuration Arduino-compatible board. With the given schematics of that board, you can already start to build your own stand-alone, minimum configuration ATMEGA board. Now, you could ask “Why don’t you just buy the Sippino, if it is exactly what you want to build?” Well, first, we are all curious and want to know, how things work. And second, having build an stand-alone ATMEGA board on your own is fun and, furthermore, allows you to easily extend it to your needs. Here, the square pin (“MISO”) refers to pin number one. “VTG” is connected to “VCC”. 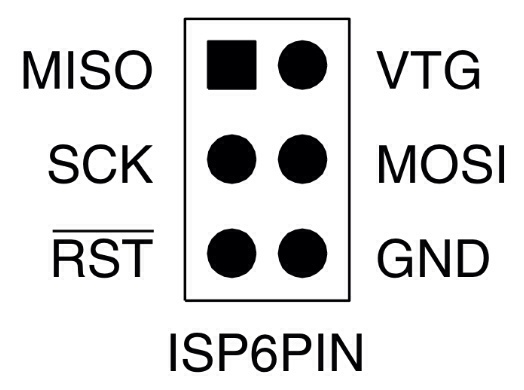 Note that the image above shows the pinout of the socket and not the connector. 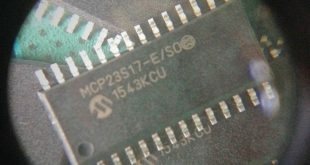 You can find the corresponding pinout for the connector, for example, in this blog post from Tim Teatro. 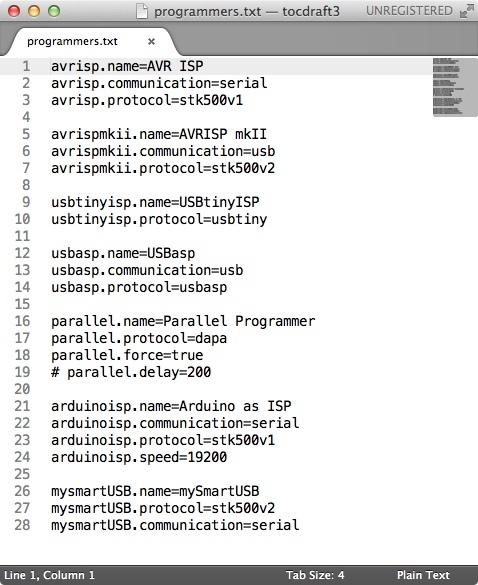 Alternatively, you could also use an Arduino board as ISP. In the following, however, I will describe the way which uses the mySmartUSB ISP. Now, if you start the Arduino IDE you can select the “mySmartUSB” (or whatever in-system programmer you have configured) in the programmers menu. Before we can use our self-made “Arduino” board, we need to burn the Arduino bootloader on the ATMEGA. Therefore, make sure that you have selected your programmer within the “programmers” menu. 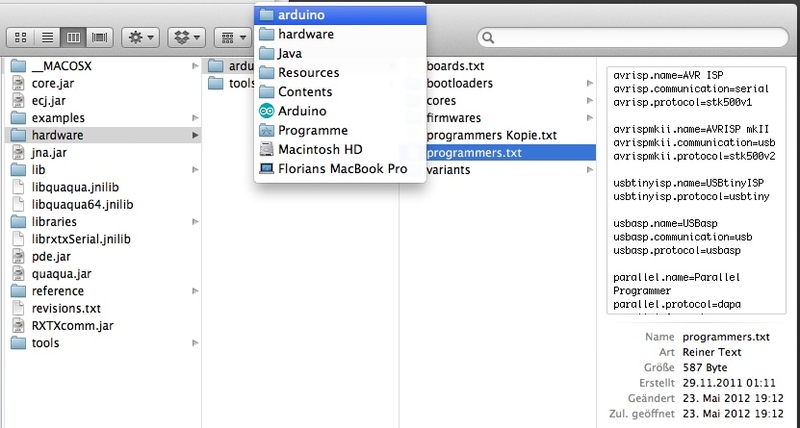 Then, select “Arduino Duemilanove or Nano w/ ATmega328” from the “Tools-Board” menu. The bootloader is transferred on the ATMEGA by selecting “Tools-Burn Bootloader”. After a few seconds, the bootloader should be transferred to your ATMEGA. If you do not press the shift key, the upload will fail. It took me some time to find out this “little” detail. If everything is connected correctly, you could, for example, go on and upload the “blink” program. 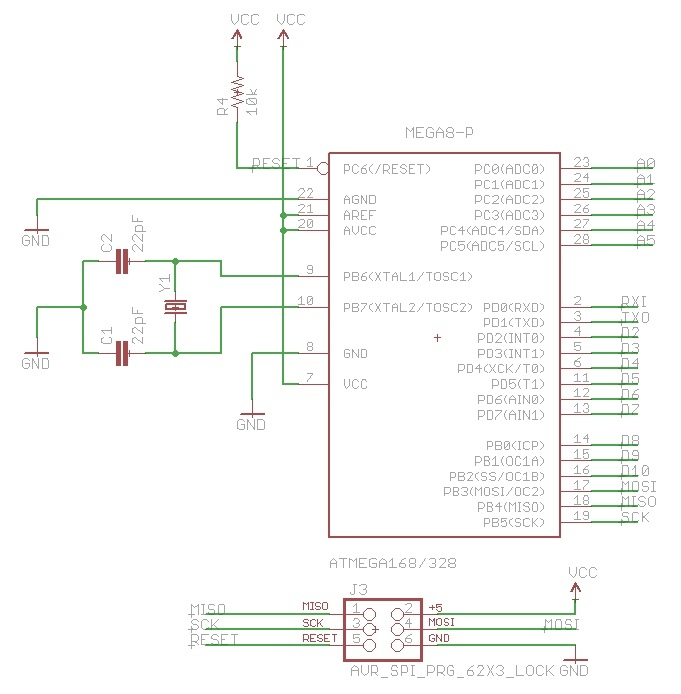 Again, if you are wondering which pins within the source code belong to the hardware pins on the breadboard, you can find a nice overview for the ATMEGA328 here. One important thing was not mentioned yet. In this setup, you need to power your circuit with an external 5V power supply. For now, you could just connect the 5V pin of your Arduino board to the VCC pins of the microcontroller, as well as the GND pin of the Arduino board with the ones of our standalone board. In the next article, I present a handy little board, which is powered by a USB connection. With this setup, you are able to build your own microcontroller projects for much less than you would pay for an Arduino. And, as you have seen, it is actually quite easy and involves only a few components! If you have any questions or comments, I would be glad to get them! You saved me!!! You are the only one who said that we have to press “shift key” to success!! Else I had a “avrdude: stk500_getsync(): not in sync: resp=0x00” error!!!! Thank you thank you!! !